A British author says a senior official from the Rwandan war crimes tribunal flew to London last week to question her about the secret confessions of a 1994 Rwandan genocide organiser that she obtained for inclusion in a recently-published book. At least 800,000 people are estimated to have been killed in the genocide at a rate - over just 100 days - that was far faster than the Holocaust of the Jews in World War Two. According to the author, Linda Melvern, the official expressed amazement at the leak of the confessions to war crimes interrogators of the Rwandan prime minister during the genocide, Jean Kambanda. Melvern obtained a copy of the transcript from unofficial sources. She said the war crimes official, prosecution lawyer Barbara Mulveney, asked her how she had obtained the sensitive documents, but the author said she declined to reveal this. 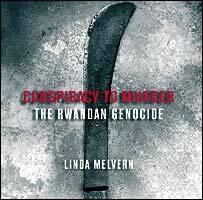 Kambanda's testimony was recorded as a transcript of 60 hours of interrogations and according to Melvern's account of it, included in her book Conspiracy To Murder - The Rwandan Genocide *, it goes into remarkable detail about the way the genocide was organised. The detailed planning is important to record because it took a long time for the outside world to realise how carefully the mass killings were planned. The genocide was often portrayed in the West as a spontaneous, uncontrollable outpouring of ethnic hatred which, as such, could not be stopped. The UN Security Council pulled most of a small UN peacekeeping force out shortly after the genocide began and key members of the Council - the US, Britain and France, lobbied against reinforcing the UN presence in a way that UN commanders on the ground recommended. But subsequent investigations, such as Melvern's book, show that in fact the killings were to a large extent planned in advance by a relatively small group of extremist ethnic Hutu politicians from northern Rwanda who obtained support from the outside world. This reinforces suspicions among many that something could have been done to stop the worst of the killings, and that this group of politicians were susceptible to outside pressure. One of the most revealing episodes from the transcript is where Jean Kambanda reveals that the genocide was openly discussed in cabinet meetings. 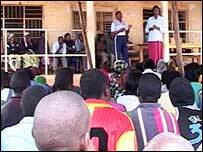 This contradicts claims by senior government officials at the time that the killings were a spontaneous expression of 'self defence' against the invading rebel (and Tutsi-dominated) Rwandan Patriotic Front. Kambanda described, according to Melvern, how one cabinet minister said she was personally in favour of getting rid of all Tutsi; without the Tutsi, she told ministers, all of Rwanda's problems would be over. 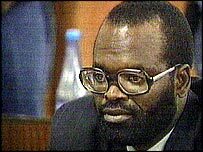 The Kambanda testimony also gave an insider's account of the roadblocks where so many Tutsi lost their lives. As Prime Minister, he received complaints from some Hutus about the roadblocks; he didn't get complaints from Tutsi for obvious reasons. Kambanda: "I did not have any"
Linda Melvern's book - based on a years of research and numerous previously unpublished documents - also goes into the fine detail of planning for a possible genocide. After combing through bank archives and government documents she reveals, for instance, that in 1993 the government of Rwanda imported, from China, three quarters of a million dollars worth of machetes. This was enough for one new machete for every third male. Machetes were used for many of the murders committed during the genocide. The details of pre-genocide arms imports from Egypt and France are also given, as is the extent of French military cooperation with the parts of the Rwandan army most responsible for the genocide.